Oh Sweet Sassy Molassey, Happy Day!! After getting an insider tip (thanks S!) I finally found pumpkin! It was a trip filled with anticipation, after being told there was pumpkin there, I rushed to the Pig immediately! I'm not familiar with the grocery store, so, basket in hand, tried to dodge assorted slow people with carts, less they try to find pumpkin before me. It was like the don't run in the halls run/walk you did back in the days of school - Run quickly to the first aisle, slow down - read the sign - no, not here, run to the next aisle, slow down, read the sign..
For the record, I *tried* to act calm and collected and did not run over any sweet elderly people. And there it was - the baking aisle! Oh no, there's 2 people down there, what if they're getting pumpkin! Say it ain't so. As they walk by, take a bit of a peek in their cart, nope, no pumpkin, phew. I can't believe what this has come to. Then I found the pie fillings - apple, no, peach, no, blueberry, NO! Where's the pumpkin!! I crouched down low to read the tiny labels, and there it was pumpkin, right underneath a big empty space. In a last hopeful effort I get down low and reach - kinda like those orange juice commercials where they reach way into the orange groves for their carton of juice - and aha!!! 2 cans waaaay in the back! Success! HOORAY!! 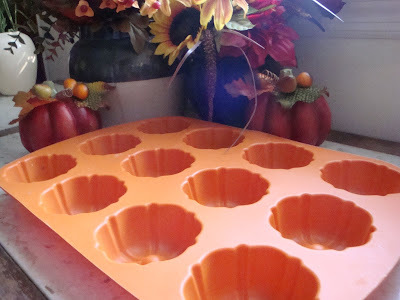 I finally get to use my pumpkin pan, check out how cute this is!! It was only $10, you can get one for yourself here! Sift the above ingredients together in a large bowl and set aside. 3 tsp extract - I like to play with extracts. This time I used 1 tsp each of vanilla, maple, and orange. Feel free to use your favorites, or just use vanilla. In a large bowl, mix these ingredients together until well combined. Slowly blend in the sifted ingredients until just mixed. Stir in one can of pumpkin. Bake in a 325 degree oven. 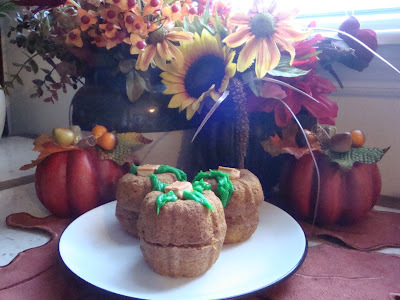 For the pumpkin muffins, 18-20 minutes. I also made mini loaves - those took 20-22 minutes, until your tester comes out clean. I did sample - just one! Ok, two, they're small, and the rest are sitting, beckoning, in my kitchen. Any takers? Now.. to the treadmill!! Had one for ya.. and then..
Oooooooooooooh, these look SO yummy! How adorable!